The tale of two very different platforms is told by the latest data from OpenSignal, which has tracked nearly 19,000 total distinct Android devices this year, up from just under 12,000 last year. Samsung remains the dominant maker of Android devices, with a 43 percent share, while the most popular Android hardware is its Galaxy S III smartphone. The plethora of device makers, many of which with their own custom skins and modifications to Android, only contribute to the fragmentation issue. And the number of distinct devices on the market tracked by OpenSignal has exploded from just 4,000 in its first report issued in 2012. When Android fragmentation is measured purely among Google's major releases, the leading installation is 4.1 "Jelly Bean," found on 26.5 percent of devices. Next is the most recent version of Android, 4.4 "Kit Kat," with a 20.9 percent share. In total there are five different versions of Android with more than 10 percent of the market. The remaining three are 4.2 "Jelly Bean" (19.8 percent), 2.3.3-2.3.7 "Gingerbread" (13.6 percent), and 4.0.3-4.0.4 "Ice Cream Sandwich" (10.6 percent). Meanwhile, only one version of Apple's iOS platform holds more than 10 percent share, and it's not even close: iOS 7 is at 91 percent, while iOS 6 holds just 8 percent. Earlier versions of iOS account for only 1 percent of installations. Those figures align with Apple's own App Store data detailed to developers on its website. The figures were most recently updated for a 7-day period ending Aug. 10, 2014. 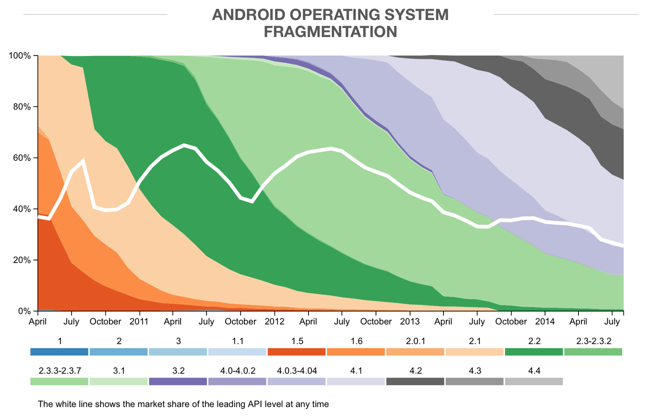 The OpenSignal data breaks down mobile operating system installations based on new application programming interfaces made available to developers, referring to it as "API fragmentation." The data is also broken down for screen size fragmentation, another area where Apple has a key advantage over Android for developer simplicity. Apple's iOS platform has been limited to four different physical screen sizes, thanks to Apple's use of pixel-doubling when upgrading to Retina displays. On Android, though, there are countless different screen sizes, which OpenSignal said is "hugely challenging" for developers trying to create applications that can work well on a range of devices. For its latest report, OpenSignal surveyed 682,000 total devices running its app. The sample size was kept the same as its fragmentation reports from 2013 and 2012 for a fairer comparison.